Have you guys heard of this Dukan Diet? It's pretty much the same as Atkin's but originates from France. I decided to give it a try since I've also started working out again (after a 9-month hiatus). All part of my 8-week weight loss program prior to my Eastern Caribbean cruise. Yes, vanity is evil, I know. Boy, this list was boring me as I was writing it out! Years ago, I used to count my calories using the WW points program, and thought of redoing it seemed a bit boring. So, I asked my friend who used to doing the points program with me what she is doing now, and she turned me onto Dukan. This isn't a diet that you can just decide to do and "go". You need to shop and plan. One of the key ingredients is Oat Bran, and it's not something most people have in their pantry, at least, not me. And because it is similar to Atkins (no carbs), most of the bread, crackers and pastas that you have in your pantry are off limits too. There are about 100 food that you are allowed to have throughout the whole diet. See the full list now. 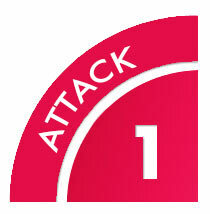 The first stage is called Attack . You only eat proteins, no veggies or fruits and definitely no carbs. You don't do this for long, it all depends on how much weight you want to lose. I'm going to try for 5-7 days of Attack. Okay, after all the grocery shopping, it was time to eat. So since I skipped breakfast, I jumped right into lunch. Too tired to cook, I ripped open the deli meats and went to town. Lunch: 75g of fat-free ham and about 30g of fat-free kolbassa. Snack: 50g of the ham. Dinner: Steamed whole trout (260g) - Method: Microwave with a sprinkling of cilantro, green onions and ginger. It takes about 5 minutes in the microwave and is super tasty. You shouldn't use too much sauce (anything with lots of sodium) so to make the fish a bit tastier, I lined the plate with two slices of the fat-free ham. Tasty and prevents the fish from sticking to the plate. I was too hungry to take a picture, but don't worry, this was so tasty and will be a repeat for sure. Midnight Snack: Oat Bran Galette. It's actually like a pancake. Simple to make, albeit a bit bland. 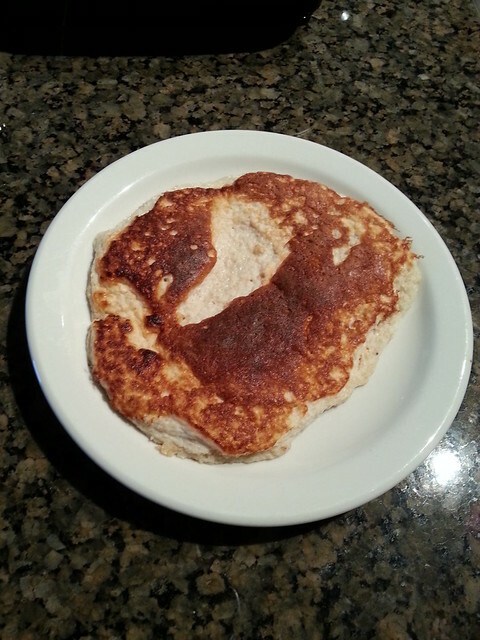 Mix 1.5tbsp oat bran, 2tbsp egg white and 1tbsp of fat free yogurt. It actually looked pretty good. So I wake up this morning for my morning weigh-in and I've GAINED a pound. I know this is shocking considering I started this diet yesterday and people rave about losing 2+ lbs overnight. However, you have to take into account that I didn't eat for the two days prior. Oh wait, that's a lie, I had a quarter of a Starbucks Turkey Bacon and Egg White sandwich. Given that I fasted for two days and then ate an entire trout, a 1 pound bump was not shocking. Let's see what happens tomorrow. 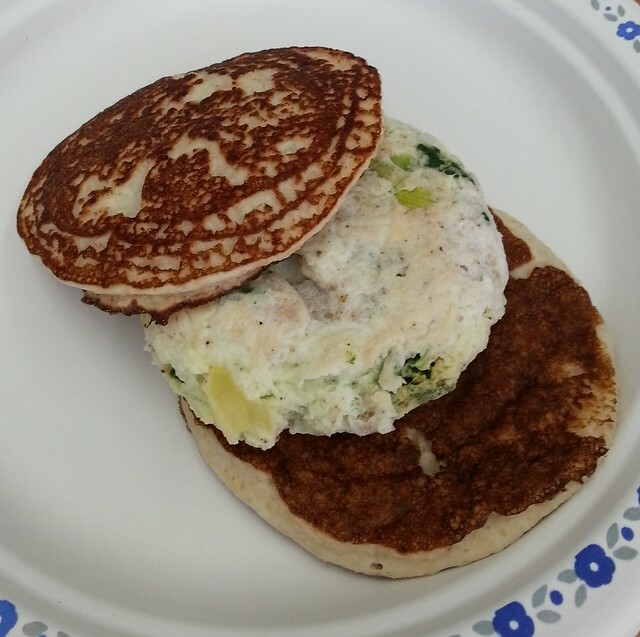 Lunch: Oat Bran Galette, with fat free Kolbassa and egg white omelette. If you toast the galette first, it almost feels like day-old bread. Dinner: 300g Top Sirloin - Method: Garlic Powder and Black Pepper to season the steak. (I did this last night). 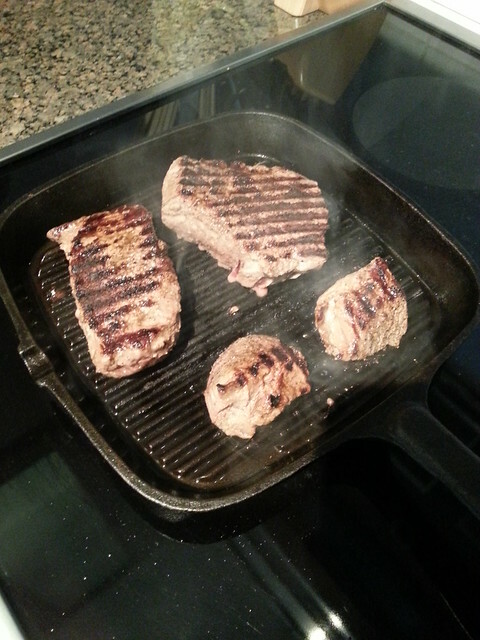 Put onto a screaming hot cast iron pan and sear to keep the juices in. After three minutes, flip and remove from the heat. After two minutes, transfer onto a plate and tent with tin foil. For additional spice, I made a paste of Frank's Red Hot with some mustard and Lea & Perrins. The above shows two full servings. 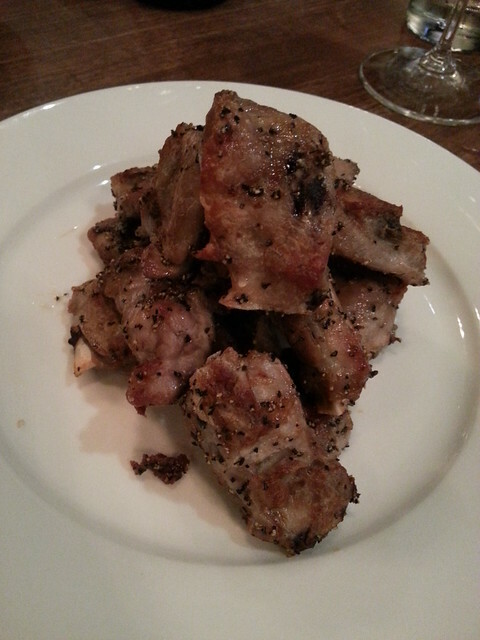 Late Night Snack: Dry Ribs from Earls (baked versus deep fried). Yes, they can do this, but it takes a bit longer (about 30 minutes) and is way healthier for you. Weigh in was more positive today. I'm 1.4lbs lighter than yesterday, but because I gained weight yesterday, I'm actually only 0.4lbs lighter over the two days. Last night was awful, I woke up and had to pee (Dukan diet side effect). I also forgot that I had the baby gate up to prevent Charlie from wandering around. So I ended up chin down past the baby gate at 3am. Ugh, now I have a Jay Leno chin...complete with bruising. 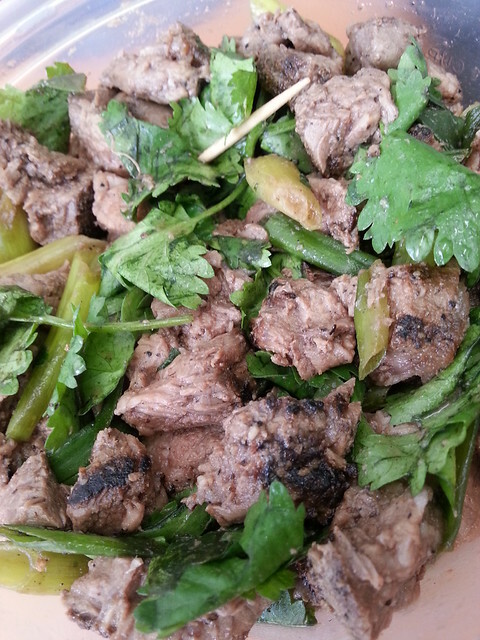 Lunch: After eating some of the steak from last night, I ended up dicing them up into small pieces, and added green onion and cilantro to make a Thai-style salad. For the dressing, I used some lemon juice and Lea & Perrins and munched on this throughout the day. I only intended being on the Attack Phase for three days, but this morning, I woke up and the scale had inched up again, so now I'm just 1.2lbs down after three full days. Reading back onto Day 1, I realized it's was a bit excessive in terms of food consumed, so I'm resetting it to Day Zero. So really, it's 1.2lbs after two whole days. Let's see if tomorrow will being some good news. Breakfast: I was attending a breakfast speaker series from Ipsos Reid this morning, held at Coast Coal Harbour Hotel. I figured breakfast would likely be all breads and fruit and I resigned myself to tea, and lots of it. Well, to my surprise, they had a few things I could actually eat! Okay, truth be told, this isn't is really Dukan approved. The eggs MAYBE, and that's if they didn't use a ton of butter or oil in the preparation. I'm pretty sure that bacon wasn't made from turkey, and the sausages were surely not fat-free kolbassa. 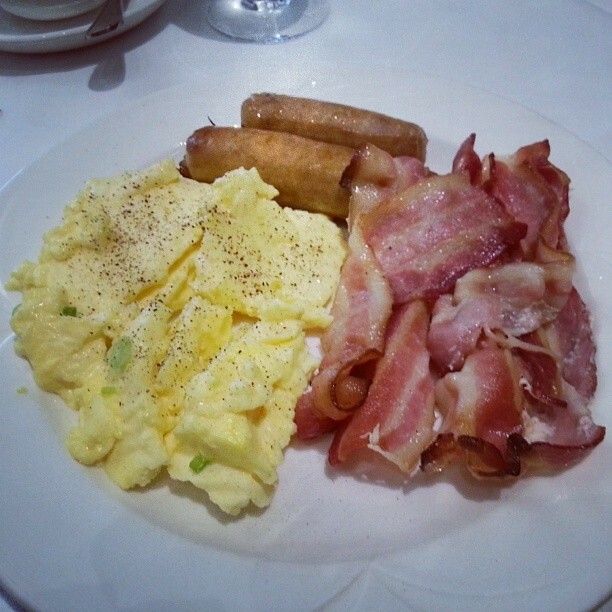 Oh well, I took a knife and fork to the bacon and managed to eat only the meatier (non-fatty) parts. As for the sausage, I had to blot the grease off it, and let's just say that I was very glad that we had a cloth napkin. It would have easily been a three napkin endeavor. Lunch: Are you kidding me? Of course Is skipped lunch, after that pile of bacon and sausages? Well, I did actually have a Blackberry Fat Free Yogurt, more like a snack, not really lunch. I'm going to be a little tired for the gym today. 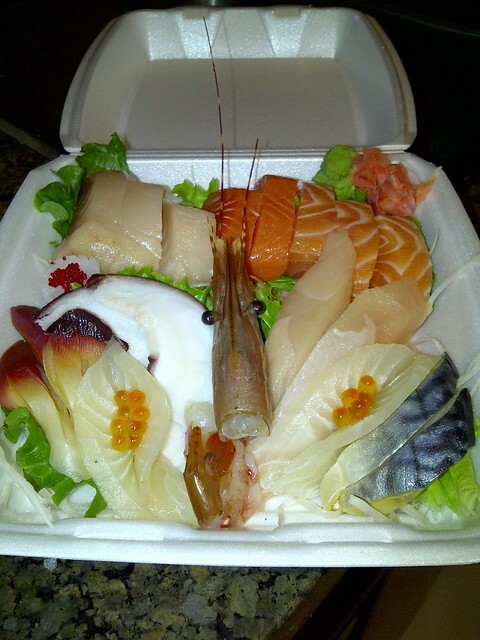 But looking forward to a yummy dinner, maybe sashimi? Dinner: Yes, sashimi it is. No to the Tako Sunomono, can't even use the lettuce and daikon to fill my tummy up! Oh well, there was a bit of dry ribs leftover from a few nights ago, it'll have to do. Oh, and yes, I did make another galette, have to get that oat bran in! Last bite of food went down around 9:30pm, very bad. Will try to eat earlier tomorrow. Breakfast/Lunch: With a little thinking ahead last night, I decided to make a few extra galettes so that I could have it during the day. 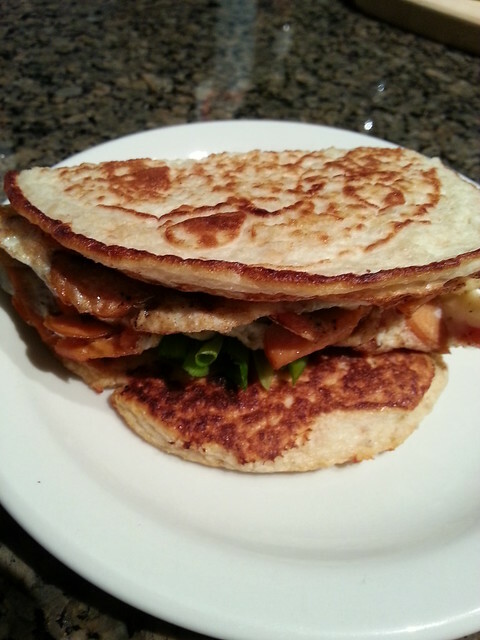 Below is the little breakfast sandwich I made last night, with the usual egg white and kolbassa omelette. (Wow, I really need to change this up. Thinking I'll use a piece of grilled salmon tomorrow. Surprisingly, I didn't eat this until about 12:30 - wasn't really hungry at all! Dinner: Definitely getting a bit sick of Kolbassa, so for dinner tonight, I decided to make meatballs. I had a pound or so of extra lean ground beef to work with. No flour or breadcrumbs allowed though. I used about a teaspoon of garlic powder (not garlic salt), generous grinding of black pepper, some Lea & Perrins and chili flakes too. 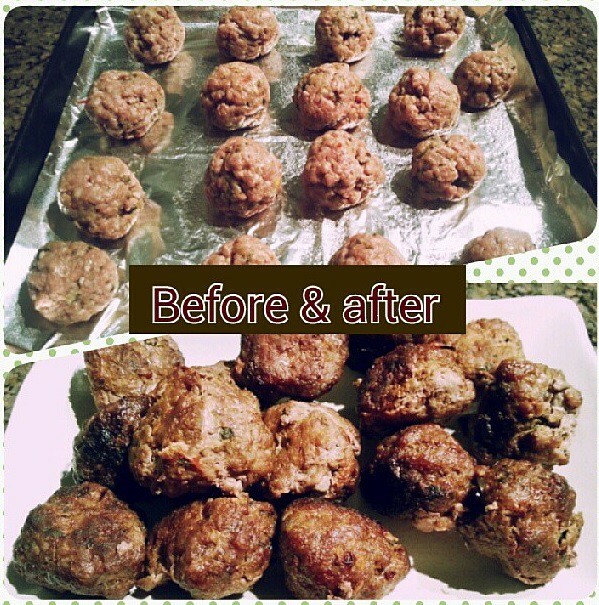 Mix to combine and then add about a quarter cup of egg whites to it and gently roll into balls. They can be a bit "loose" but a light-handed touch is key here. It turned out okay after sitting in a 425 degree oven, 30 minutes total, flipping after 15 minutes. Breakfast: After the hassle of making meatballs the night before, I was too lazy to make another Oat Bran Galette. I took the easy way out. 1.5 tablespoons of oat bran, 3 tablespoons of hot water and a splash of milk was my breakfast. I ate it in a white styrofoam cup with a white plastic spoon. There will not be any photographic proof as the whole meal was white (milk) on white (cup) on white (spoon). Lunch: Meatballs! I only had three of these last night (I made 17), I divided the remaining 14 into two portions, so I have 7 available to eat at lunch time! Dinner: I've had a piece of fish in the fridge for a few days now, and rather than risking food poisoning, I decided tonight was the night to make this for dinner. 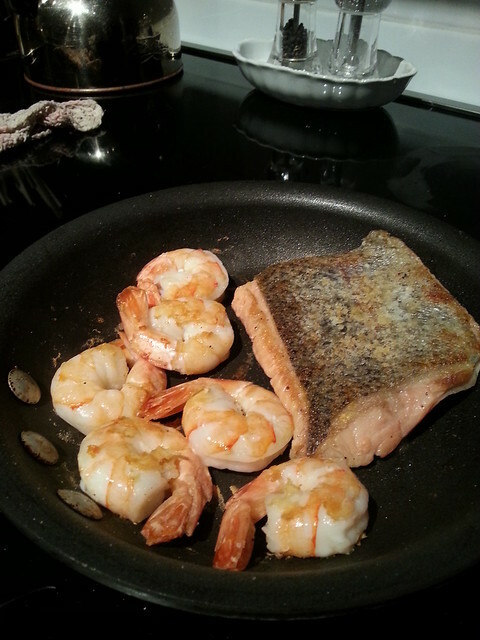 I also had a few prawns that I thawed, and added that to the mix. There wan't much seasoning, just good old salt and pepper. Hooray for Crispy Skin! Dessert: Yes, you read it right, dessert is allowed on this diet. 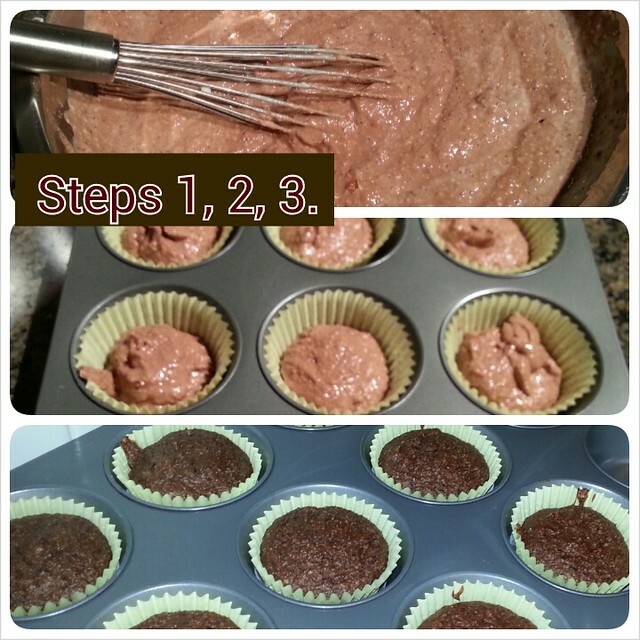 I found a recipe for Oat Bran Chocolate Cupcakes and decided that that it would be a new way to work the oat bran into my diet. I made 9 of these, using 9 tablespoons of oat bran and 3 teaspoons of splenda, along with egg whites, fat free yogurt, baking powder and cocoa powder. They didn't rise much but had a nice cake-like texture. Note to self, spray the muffin paper liners with PAM because the muffins stick to the paper like crazy! It's a delicious way to work the oat bran into your diet, especially if you have a sweet tooth. Next try, I'm going to add some vanilla. Dinner: Chicken Breast Nuggets - just chopped, dipped into a bit of egg whites. 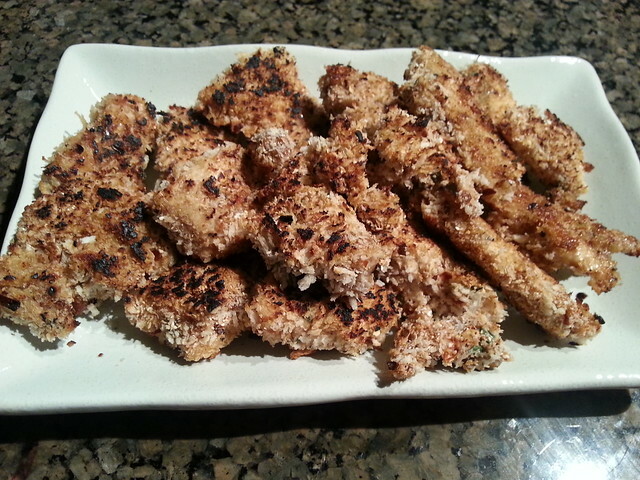 Batter is panko based with loads of pepper and chili flakes. Bake in oven until crispy. 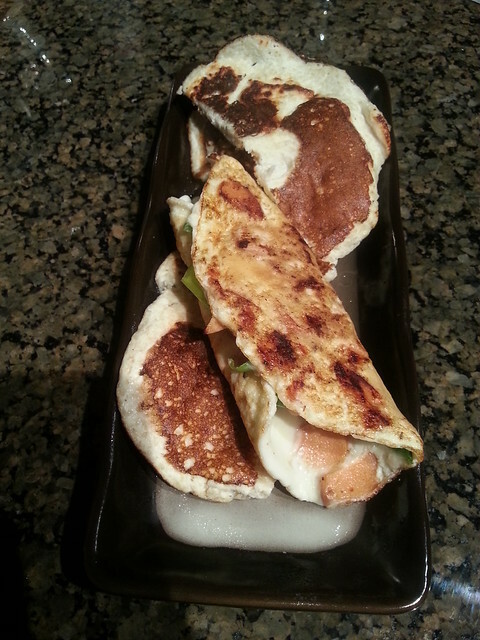 I think Oat Bran Galette, with fat free Kolbassa and egg white omelett are very good and healthy. It is very good for the health. Thank you for your great post. I've learnt some important things from your blog. I'll bookmark your blog for future visit. keep posting good contents please. Thanks again. actually left a comment. I've bookmarked your site and shared this on Facebook. Oodles of Noodles at Deer Garden!